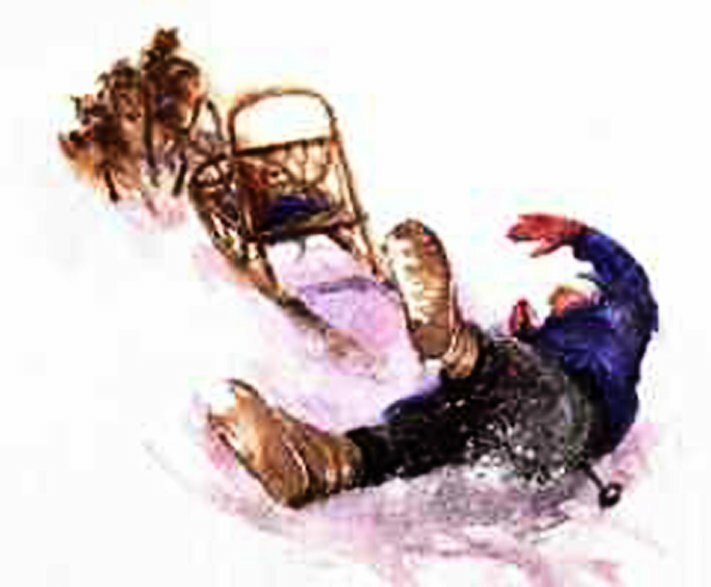 Illustration from the award-winning book with Wintergreen stories "Born to Pull"
As a dogsledding fan noted, "Watching dog teams getting ready to run is like observing a cocktail party in fast forward. Frisky females flirt for attention. Alpha males preen and strut. Lesser males scuffle and show off. Older females hold the show together by being staid and sensible. And all the while a cacophony of yips and yowls echoes through the surrounding forest. But then suddenly all is silent, serene and sublime as you launch your team and head down the trail." And it remains sublime, unless of course you lose your team as I once (and only once!) did during my first years of mushing in Ontario's Wabakimi Wilderness. Though dogsled adventure tours have been a way of life for my family and I for over 30 years, I first learned the art of mushing back in the late '70s from the famous adventurer Will Steger. My wife Susan and I lived in a sod-roofed log cabin with no power and no phone at his remote homestead near Ely, Minnesota. Since the nearest road was over 2 miles away, we brought in all our supplies by dog team. During our first winter Will spent weeks teaching my wife Susan and I everything he knew about the art of mushing and Canadian Inuit dogs and then he capped it all off one day by saying, "Everything I've taught you all boils down to this, just be sure you never let go of your sled." The significance of that lesson hit home hard a few weeks later when I set off by dog team to gather firewood along an old logging railroad grade near the homestead. The day went well and near dusk I headed off to fetch one last load. Normally, I'd tie the dogs off to a tree each time I'd stop to load the sled. But on this last trip of the day I figured they were tired enough to sit tight while I bucked the wood and brought it to the sled. Boy, was I wrong. Perhaps they caught the scent of a passing deer or maybe they saw a rabbit race across the trail far ahead. Whatever it was, something triggered all six of them to suddenly lurch upright in a flash and bolt down the trail. I lunged to grab the sled but I fell in the snow and the empty sled banged merrily down the trail. I yelled for them to stop but they were soon out of earshot so I took off in a dead run after them. Before long they disappeared around a bend, headed in the direction of Jackfish Bay on Basswood Lake in the Minnesota-Ontario border wilderness. A few miles later, drenched in sweat that was rapidly caking my clothing with ice in the crisp air, I reached the shores of huge Basswood Lake. In the dimming light I stared out at dog tracks disappearing under drifting snow across miles of the lake that stretched to Canada. There was no sign of the dogs. Had I lost the team forever? I frantically scanned the horizon hoping to catch a clue as to where they went. Just as I was about to give up in despair, something caught the corner of my eye. There appeared to be a speck out towards the middle of the bay. I didn't recall there being any islands in that area so, battling hypothermia, I trudged out through the deep snow to investigate. The speck got bigger. Soon there appeared to be some movement. Then an immense flush of relief swept over me as I realized I had indeed found the dog team and sled. Curiously the dogs were sitting quietly in a circle. As I got closer I realized that a the center of the circle was a lone ice fisherman sitting on his bucket jigging for crappies. As I approached the fisherman he never looked up but simply said, "All I want to know is this: who's going to pay for all my crappies?" I was perplexed and there was odd moment of silence. But then he looked up, shook his head with a laugh, and explained what had happened. While making their way across Jackfish Bay, the runaway team had smelled his day's catch laying on the ice and raced towards him. Before he knew what to do my dogs had snarfed down all the frozen fish he had caught and laid out on the ice to freeze. He figured somebody would eventually come to retrieve the team and so he simply sat down to catch some more. I was overjoyed to find the team intact and I apologized profusely for my 'fish thieves.' Fortunately the old timer was clearly humored by the situation. He accepted a ride back towards Ely on the sled with me. When I dropped him off at his truck he looked back with wry smile and said, "Never let go!" If it's true that you're not a real musher until you've lost your sled at least once, then that day was my rights of passage.